As part of the continued reboot of the agency, Y&R London has appointed Sophie Lewis, currently head of planning at Iris and one of the 2014 winners of the IPA’s Women of Tomorrow competition, as its new chief strategy officer. 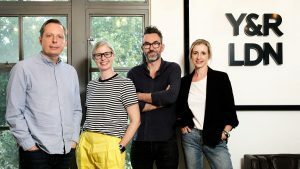 Sophie will sit on the senior management team, working alongside Paul Lawson (CEO), Jon Burley (CCO) and Katie Lee, the recently appointed managing director, in defining the agency’s strategy and driving forward Y&R London’s growth plans. Her responsibilities will include leading the agency’s strategic output working across Y&R’s client base, continuing to build the strategy department’s breadth of capability and helping to guide the future strategy for Y&R. With a career spanning more than 20 years in the industry, Sophie’s experience ranges from large global networks to independent creative agencies. She started out in account management rising to business director at BBH before taking on planning roles at Mother, JWT, AMV BBDO and Iris. Over the course of her career she has worked across a number of the industry’s most high profile campaigns including Boot’s ‘Here come the Girls’, Sainsbury’s ‘Christmas in a Day’ and Libresse’s ‘No Blood’. She replaces current CSO Emily James, who has chosen to step down to pursue a freelance career but will continue working for the agency across key clients.